This is the tale of the Lady Caissa, body-heir to Baythan (who has too many titles to repeat here), and her coming of age on the planet of Demeathorn. It depicts a very stylised, stilted society bound by rigid rules – especially when it comes to procreation. Body-heir contracts can be extensive and have clauses that can reverberate down the years. When Baythan demands that Caissa consider a body-heir contract with a certain man, Caissa is determined to find out why. Her search – and frustrations – lead her to unwittingly discover Demeathorn’s greatest secret, something that’s never been mentioned in her presence, and love. 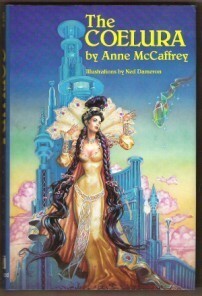 This is one of my favourite McCaffrey stories, and gets reread with regularity. Definitely one of my comfort reads, or a palate cleanser when I feel the need for one. Though the society depicted is stylised and artificial, Caissa is a break from that mold, and the coelura are creatures second to none. Definitely one of the most intriguing, imaginative conceptions I’ve come across in all my years of reading science fiction.